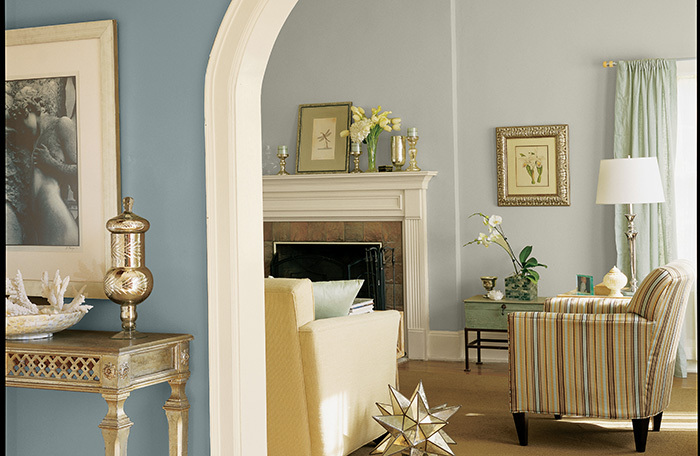 Coral Reef (SW 6606), a vivacious hue, is Sherwin-Williams Color of the Year 2015. It's paired here with Ryegrass (SW 6423) for the perfect upbeat palette. If picking one paint color isn’t challenge enough, how do you find colors for an entire house? And colors that actually work well together? Where to begin? We asked local designers to help us through the process of not only selecting colors, but also the inspiration (and a little courage) to make it work throughout an entire house. Connecting rooms with color may not seem very important if those rooms are separated by closing doors. But when unrelated colors can be seen in adjoining rooms – especially in an open floor plan – the living space will feel disjointed and jarring. The goal is to create a smooth and harmonious flow as you walk from room to room. But that doesn't mean you have to paint all of the connecting spaces one color. “The goal is to give each space its own identity while still achieving a feeling of unity,” Anders explains. Find colors to create that personality but choose colors that play well together. To help you decide on a color palette, start by picking a color for the biggest, most centrally located room in the house (such as the living room or kitchen). Or start with the room where you plan to paint the boldest color. Looking out from this room, choose a softer, more subdued color for the next rooms. And while you are free to place bold colors next to each other, it does carry more risk, so painter beware! “Changing the values or sheen of a color really helps create cohesiveness,” says Jane Bennett, owner of Faux Studio in Eagle River. For example, if you paint the focal point wall of your den a vibrant blue, you can choose a lighter shade of the same color for the other three walls. Or, for continuity, choose one color as a recurring hue throughout the house. Or the connections can be more subtle – such as fabrics or accessories of the same hue in each room. The color of a coral pillow in a living room filled with neutrals, for example, can become the main color of a nearby bathroom painted coral, with neutral accents. If you paint adjoining rooms in strongly contrasting colors, for example, connect them by using flooring or area rugs that include both colors. You also can use tone to pull the same color into adjoining rooms without creating a look that’s too one-note. “When you see those colors represented in a repetitive way, except in different values – lighter or darker – it helps with flow,” says Bennett. But you don’t have to buy six different shades of green. Instead, Bennett suggests using a glaze applied over your original color to change its tone. An earth brown glaze, for instance, reduces the brightness of most colors and makes them warmer. Tone plays an important role even if you prefer to stick with neutrals. The color of the accessories and accents you place in a room can completely transform a neutral by bringing out its undertones. Take today’s trendiest neutral: gray. “There are cool grays and warm grays; gray can take on a green, blue or pink cast,” explains Cathy Stoltz of By Design Décor in Fairbanks. You can maintain flow by painting every room gray – but change things up by selecting different shades of gray and using rugs, artwork and painted accents to bring out the undertones of that neutral. Neutrals are crucial even in homes that incorporate lots of colors. “You need places for your eyes to rest,” says Anders. 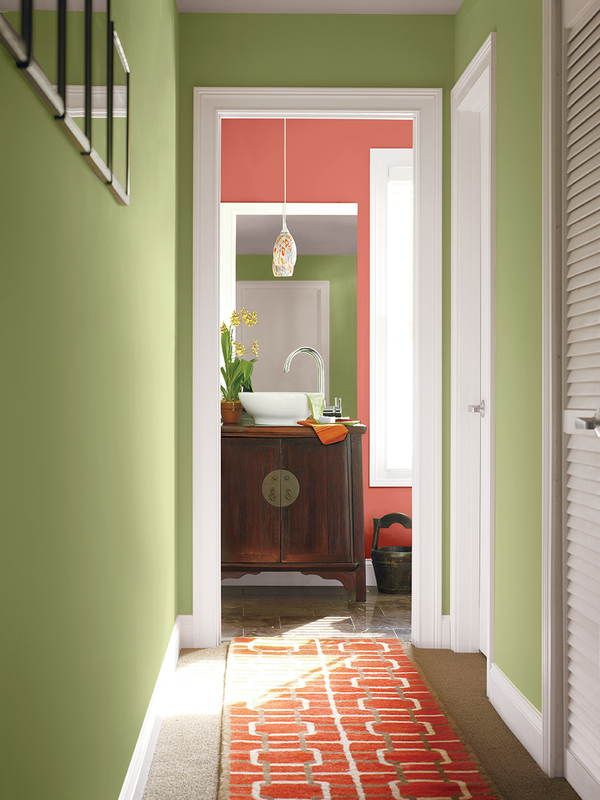 You can get away with having adjoining rooms with bright, contrasting colors by painting the transition space – the trim on the doorway or the connecting hall – a neutral color. You can use an off-white or a beige on all the trim to provide relief for the eye and to tie rooms together. Need some ideas to get started? One way to begin is to look at a paint card or color deck. “There’s typically about five or six different selections on one deck that are all in the same color family but range in tones and hues,” explains Bennett. “If you want to create drama but maintain cohesiveness, you can pick colors from that palette in any combination.” And you can be sure those colors match because they will all have the same balance of undertone. If you like blues and greens, bring warmth into your home by replacing neutral creams or tans with taupe-gray, pink and plum accents, which bring out the warmer tones in colors that usually slant toward cool. Or if you go with more neutral walls, you can layer color and pattern to create interest – like turquoise and purple pillows, rugs or curtains with bold, geometric shapes. Your home doesn’t have to be just a collection of rooms. With a little planning, it can be a cohesive, thoughtful space that reflects your family’s taste and personality. So, grab your paint roller and get creative!